Designed to empower women to take an active role in the ELFA and their workplaces, the inaugural Women’s Leadership Forum provided leadership development sessions on effective networking, communication and persuasion and opportunities to build relationships with other women in the industry. 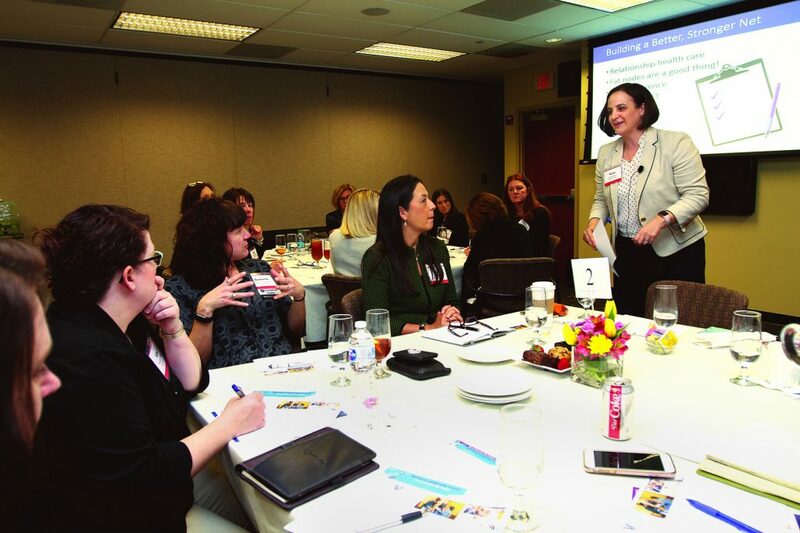 Dr. Terri Boyer, founding director of the Anne Welsh McNulty Institute for Women’s Leadership at Villanova University, interacts with attendees during a presentation on building a better, smarter network. 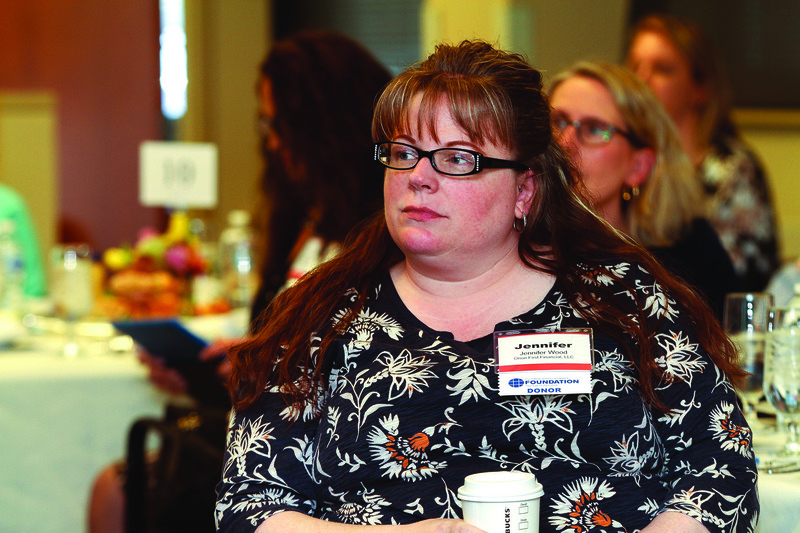 Interest in the Equipment Leasing and Finance Association’s inaugural Women’s Leadership Forum was so strong the association had to turn women away. 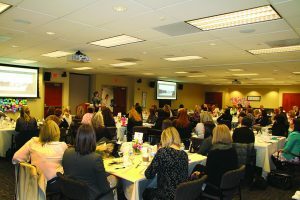 The two-day event, hosted by DLL at its Wayne, PA headquarters and presented by the ELFA Women’s Council, focused on leadership development for women at all stages of an equipment finance career. ELFA Chairman Dave Schaefer, CEO of Orion First Financial, introduced ELFA Women’s Council Chair Lori Frasier, SVP of Strategy and Performance Management at Key Equipment Finance. He expressed his excitement regarding the high turnout and level of interest in the forum, noting the ELFA board of directors’ strong support for the Women’s Council initiative, which he said will provide important benefits for both the association and the equipment finance industry. 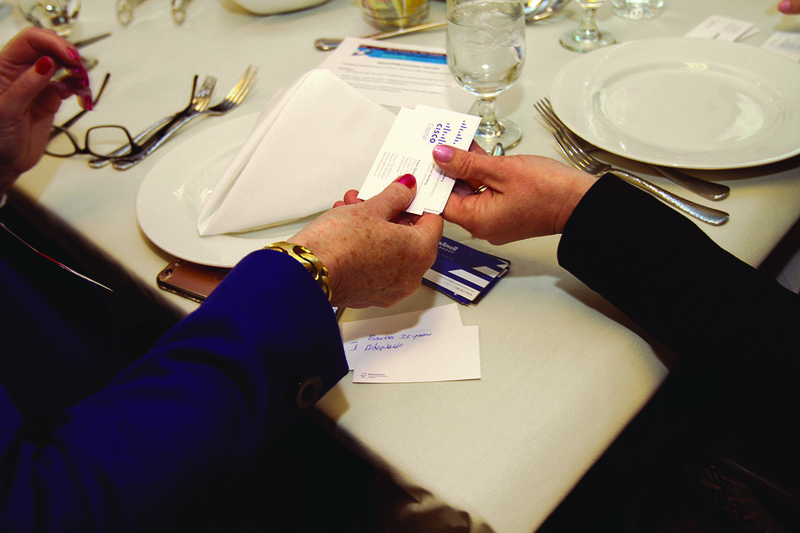 At a networking luncheon, attendees exchange business cards during an exercise which sparked meaningful — and entertaining — conversations. The seed that blossomed into this event was planted when Frasier attended her first ELFA convention in 2003. Armed with a stack of business cards and intending to introduce herself to every woman she met, Frasier was disappointed to discover the women attendees could have fit in a broom closet. Instead of becoming discouraged, Frasier took action. She set out to help women feel welcomed by the ELFA and to believe the association is a place where they belong. Following Frasier’s warm welcome, attendees enjoyed a networking luncheon while participating in an exercise which sparked meaningful — and entertaining — conversations. Tablemates took turns handing out business cards, discussing their claims to fame, asking for help and sharing how they could be of service. 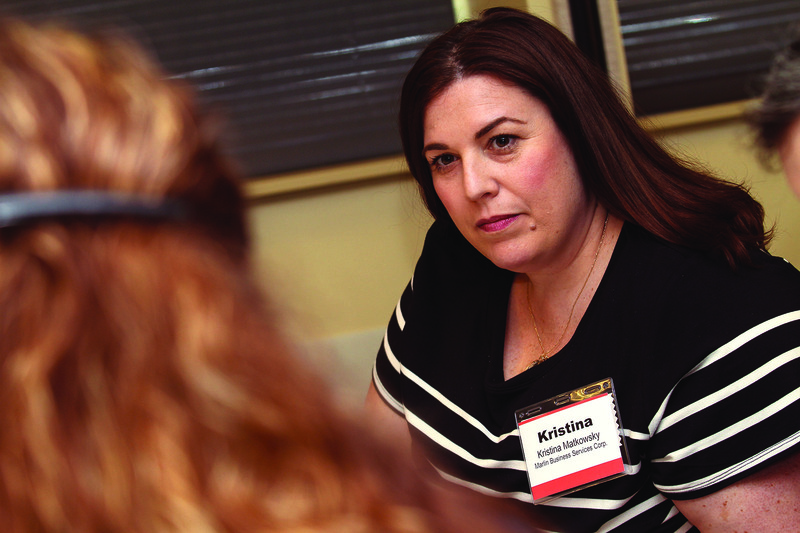 To encourage networking, attendees were assigned seats with a different group each day. ELFA Women’s Council Chair Lori Frasier, SVP of Strategy and Performance Management at Key Equipment Finance, welcomes attendees to the inaugural Women’s Leadership Forum. She wants women to feel like the ELFA is a place where they belong. 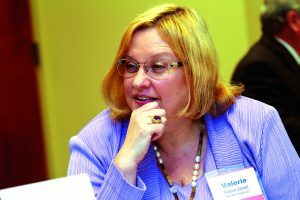 The first speaker, Dr. Terri Boyer, founding director of the Anne Welsh McNulty Institute for Women’s Leadership at Villanova University, explained the science behind building a better, smarter network. To make strategic connections, Boyer encouraged attendees to pay attention to the three types of networks — task-oriented, career and social — and to remember every level of connection matters. During an exercise designed to identify critical partners in a network and determine which type(s) of networks these individuals belonged to and the reciprocity of the relationship, Boyer also taught attendees how to evaluate the WIIFM/WIIFT (what’s in it for me/what’s in it for them) of each connection. 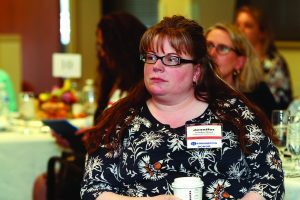 Boyer said scheduling quarterly network checkups — setting aside time to update your resume and evaluate your network to identify areas of strength and weakness and intentionally fill gaps — is a vital component of networking. She encouraged attendees to add these tasks to their calendars. 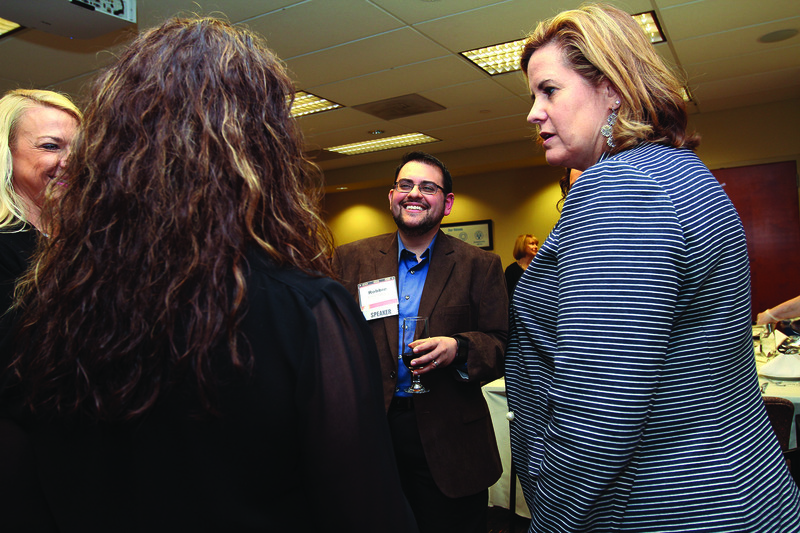 Becoming aware of the difference between mentors — who provide connection, guidance and advice — and sponsors — who actively advocate on your behalf — is also essential to networking, according to Boyer. 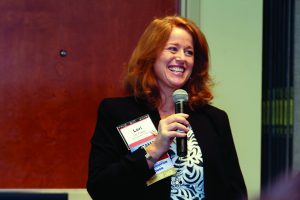 First time ELFA event attendee Jennifer Wood, SVP of Client Services at Orion First Financial, said the forum inspired women to feel empowered, believe in themselves and take risks designed to improve the industry. Robbie Samuels, networking expert and author of Croissants vs. Bagels: Strategic, Effective, and Inclusive Networking at Conferences, delivered the second talk of the day, “Art of the Schmooze.” Samuels started off by pointing out that women, for the most part, do not excel at traditional “spray and pray” networking. Instead, Samuels argued women are adept at relationship building and helping people. Samuels asked an amusing yet accurate question: Women have the right to vote, but when will they have the right to pockets? Given that women’s clothing tends to be lacking in this department, Samuels encouraged attendees to bring a jacket with pockets to conferences so they can keep business cards handy. 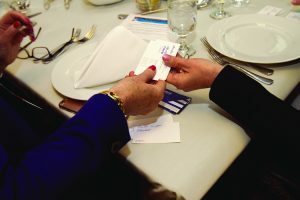 Although we live in a digital age, Samuels said old fashioned business cards are still an essential networking tool and encouraged attendees to have multiple cards — for hobbies and passion projects in addition to professional cards. With the help of several volunteers, Samuels demonstrated the difference between being a bagel — standing with a group in a closed circle — and being a croissant — leaving an opening in your semi-circle so others can easily join your group. Robbie Samuels teaches attendees the fine art of being a croissant at networking events, which enables others to join a group easily. During the cocktail reception that followed, many attendees practiced the skills they learned in Samuels’ talk, forming perfect croissants across DLL’s atrium. To close the first day, many attendees opted to join dine arounds hosted by ELFA Women’s Council members at local restaurants. Amanda Dooley, digital communications and content partner at DLL, launched day two of the forum with a session designed to hone attendees’ LinkedIn skills, “Breakfast 100Club: Let’s Get Social.” Dooley covered basics like setting up a profile, making connections and sharing engaging content. Boyer returned for a second session, “Walking the Line: Gender, Communication and the Double Bind,” which focused on effective communication strategies for women in leadership positions. Boyer asked attendees to draw a picture of an effective leader — one of the most engaging drawings was an octopus with glasses drawn by Valerie Gerard, senior managing director of Management Consulting at the Alta Group. “When our session leader, Terri Boyer, asked us to draw our interpretation of a leader, my first thought was to highlight the attributes of effective leadership because it applies to female and male leaders alike,” Gerard said. “At this point, I fully embraced Terri’s direction to be creative in drawing my interpretation. The octopus concept effectively showcased what made that leader successful — the glasses implied that the leader focused on important details while having a strategic, big picture vision and each tentacle represented a key leadership quality. Dr. Terri Boyer asked attendees to draw an effective leader during an exercise. Valerie Gerard, senior managing director of Management Consulting at The Alta Group (above), created one of the most engaging drawings of an octopus with nine tentacles wearing glasses. After analyzing the drawings, Boyer said our culture typically portrays leaders as men. Women face a double bind when it comes to adopting the masculine traits associated with leadership: They’re not likeable if they do, and they’re not strong enough if they don’t. During an exercise, attendees wrote positive and negative leadership traits of men and women on sticky notes and arranged them in categories. Reviewing the notes, Boyer pointed out that men’s leadership style is viewed as competitive and based on hierarchy while women are seen as collaborative, leading from the center to create a transformative model. While this approach is more difficult to execute, Boyer said it is more effective and leads to personally invested team members. Tanya Menon, Ph.D. of Ohio State University’s Fisher College of Business explains that ‘I’ is the least persuasive letter in the English language. Tanya Menon, Ph.D., associate professor at Ohio State University’s Fisher College of Business, led the session on persuasion — the center of all management. Menon played a short documentary about a meeting between President Lyndon B. Johnson and Alabama Governor George Wallace to discuss a civil rights march to demonstrate the aspects of effective persuasion. Menon said attempting to persuade by using power leads to defensive power struggles and resistance or the “spit in your soup” problem, often encountered in organization change, which creates subtle resistance such as negative talk. Highlighting similarities also establishes likeability as does building up the other person’s ego. “I’ is the least persuasive letter in the English language,” Menon said before suggesting attendees say, “You are right” instead of “I agree” in conversation. 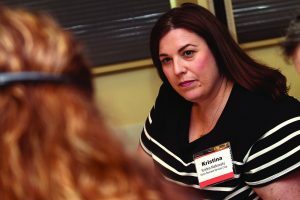 Kristina Matkowsky, AVP of Customer Service at Marlin Leasing, recognized the important role men play in advocating for the empowerment of women in equipment finance organizations. Frasier closed the event by asking the women to take the energy and enthusiasm of the forum back to their individual organizations. “During my 30 years in corporate America, women have come a long way, but we only need to look at the statistics to see that we still have a long way to go,” Frasier said. “While women make up a full 56% of the workforce in financial services, they only occupy 29% of executive positions and a mere 6.8% are CEOs. We know that at the current rate of change, it will take decades to reach gender-balance in these senior leadership positions. 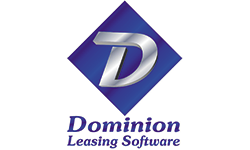 We also know that organizations led by balanced teams are more profitable and resilient. For this reason, it is in everyone’s best interest for more women to be prepared and empowered to lead. 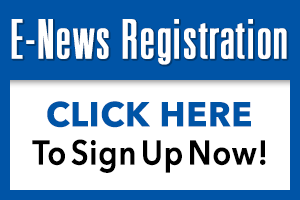 Given the success of the inaugural event, ELFA has scheduled the 2019 Women’s Leadership Forum for April 1-2 in Washington, D.C.